Absolutely love this cologne, The minute i smelled it i knew i would enjoy it. Havent got any compliments yet. But i can guaranty you there will be many coming when i really spray myself up! I never tried the original invictus, but someone advised me to go for the intense version and man, I'm happy that i did! My favorite fragrance ever. Most compliments no matter what time of year or the situation. This is the perfect blend of sweet and sophisticated. The club meets the gym. Get this right now. 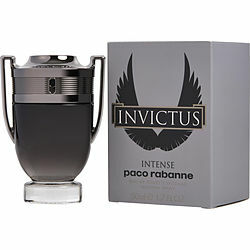 Invictus Intense is just a great fragrance. It has a very unique smell to me that I really enjoy. Somehow it’s sweet but on the fresh side also. You’ll get compliments, you’ll get double sniffs from women, the performance is really good too. Easily get 8+ hours from this fragrance. Would highly recommend to any friend. Invictus Intense My husband felt in love with it, I gift it to him and we have to hide from my teen son because always want to use, it's expensive but we don't care pay for this fragance because smell fantastic it's the best ..we love it !! !